Sometimes USB devices have problems and when it happens it can be frustrating. We’re big fans of choosing the simplest fix first. Why? Because it saves time. If the simplest fix doesn’t work, then you’ll still have the opportunity to roll up your sleeves dig down and look at other things that may be causing USB issues – like drivers and USet featured imageSB Controllers (in Device Manager). But today, we’re going suggest the easy way and tell you about Microsoft’s Windows USB Troubleshooter. All you have to do is download and run it – and let it do its magic. The Windows USB Troubleshooter was made to diagnose and repair USB problems like the ones mentioned and others. According to Microsoft the USB Troubleshooter was create to work with USB audio, storage, and print devices—such as thumb drives, USB hard drives, and USB printers—that do not eject using the Safely Remove Hardware dialog box. You can download Windows USB Troubleshooter from Microsoft from this link. The file name is “WinUSB.diagcab”. All you have to do is download it and run it. 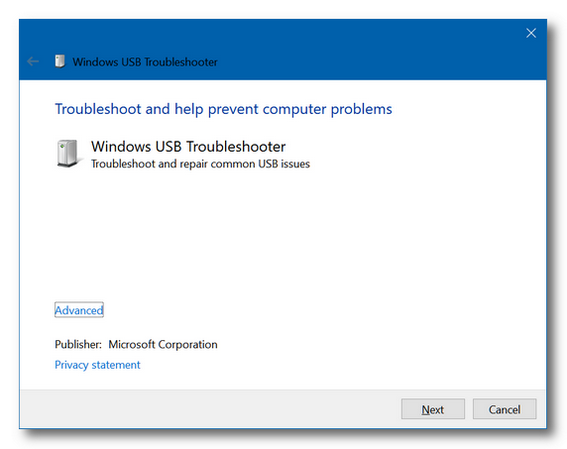 The Windows USB Troubleshooter works on Windows 7, Windows 8x and Windows 10 (all versions).